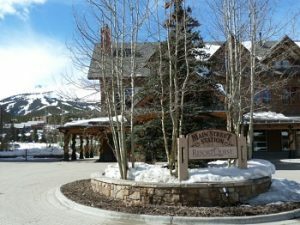 Main Street Station Condos are ski in ski out condos for sale in Breckenridge CO Real Estate. Located at the base of Peak 9 of the Breckenridge Ski Resort and on Breckenridge’s Main Street the location is perfect for those who like to ski but also want to enjoy shopping and dining in Breckenridge. Built in 2000, Main Street Station Condo has a total of 82 residential units comprised of 9 – studios, 38 – 1 bedrooms, 23 – 2 bedrooms, 8 – 3 bedrooms and 4 – 4 bedroom condos ranging in size from 355 – 1957 square feet. Each condo is professionally decorated with granite in the kitchens and bathrooms, decks that feature ski area, main street or mountain views, gas fireplaces and underground parking. While enjoying your stay at Main Street Station Condo in Breckenridge, Colorado take in all the amenities including an indoor/outdoor heated swimming pool with panoramic views of the Breckenridge Ski Resort, 6 hot tubs, fitness center with eucalyptus steam room, private 25-seat movie theater (must be reserved), pioneer club to relax by the fire and enjoy a cocktail, 24-hour front desk and bell service and an onsite concierge. When considering Breckenridge Real Estate, Main Street Station is a condo complex not to be overlooked. For a private showing of the condos currently for sale in Main Street Station or other properties for sale in Breckenridge CO Real Estate contact Justin & Krystal Knott with LIV Sotheby’s International Realty.